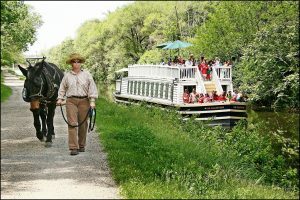 Visit the Illinois & Michigan Canal National Heritage Area & take a journey back in time aboard the “Volunteer,” a mule-pulled 1840’s replica canal boat, as it coasts gently up and down the Illinois & Michigan Canal. Every trip begins with “Mule Tending 101” as our period dressed guides introduce the passengers to their intrepid canal mules, Moe & Molly. The tour guide regales everyone with tales of the canal while the deck hand, mule tender & boat captain guide the boat one mile up the canal to the Little Vermillion aqueduct and back. Mary Todd Lincoln has been known to ride the boat, knitting in the corner and telling fantastic stories of her time in the Nation’s capital with Mr. Lincoln. 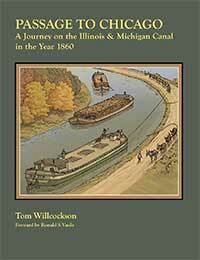 Families of all ages, historians, photographers and nature lovers will love this historic journey into Illinois’ scenic past! Visit the online calendar to see available dates. Tours run May through October throughout the week. Visit our Group Tours page for customized group tours & lunches! Visit our Events page information about special boat tours. After your ride, be sure to check out downtown LaSalle’s shops, restaurants, antiques and the beautiful Hegeler Carus Mansion. Visit the I&M Canal Visitor Center, located inside the Lock 16 Cafe, which serves breakfast & lunch all day, everyday! Brides to be should stop by Marien Mae’s bridal, a beautifully restored environment with gorgeous dresses. Be sure to check out the vintage market Canal Cargo, across the street from Lock 16! For more information about group rates, school field trips & special boat rides call (815)220-1848.